One of the highlights of our Best of Europe in 21 Days tour was our group hike. As this was pretty demanding--and there was a concern about snow on the trails this early in the season--only the fittest of our group participated. 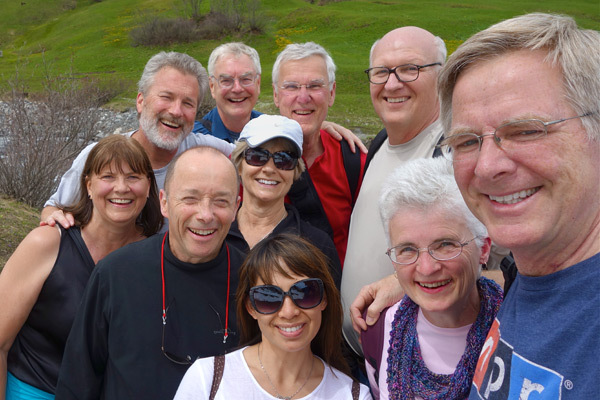 For me, it was a joy not to be saddled with research chores but to simply enjoy half a day hiking in Switzerland with a wonderful group of traveling friends. We started our day gazing down at this high alp--where the cows spend their summers Heidi-style--from the revolving restaurant capping the Schilthorn in Switzerland's Berner Oberland. Looking down at these high meadows, I'm always tempted to actually hike through them. 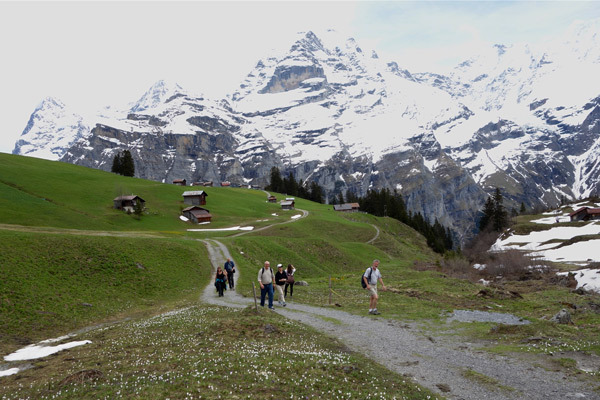 And that's exactly what we did, taking the North Face Trail from Mürren under the Schilthorn. Coming upon this meadow, high above the tree line, was a delightful reward for the climb. When hiking in the Alps, take layers of clothes, sunscreen, a mobile phone, appropriate shoes, and big smiles. These travelers, the most rugged third of our tour group, were great walkers. 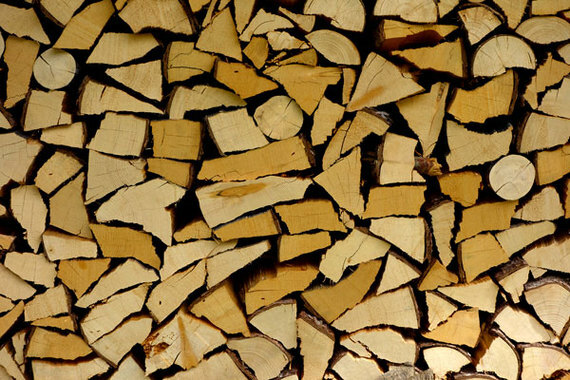 The Swiss organize their firewood like they organize their populace: extremely tidy. It's dangerous to generalize about different nationalities...but I love to. The Swiss are neatly stacked. How would you characterize the Swiss? 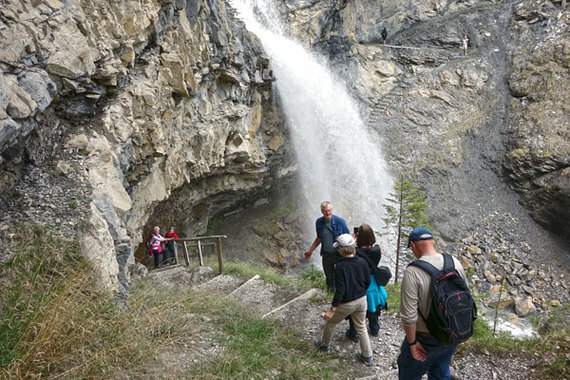 A highlight of our hike was venturing under this powerful waterfall called Sprutz. 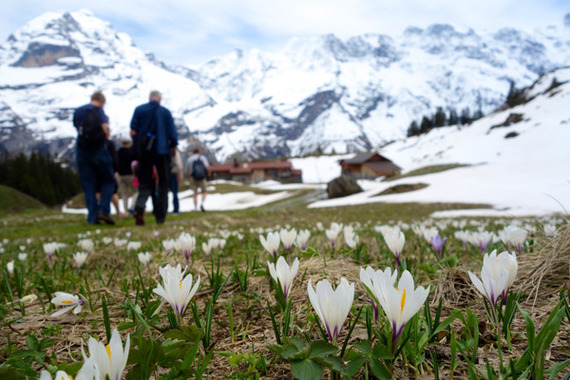 Our hike had a happy ending, popping out in a flowery meadow at the tip-top of my favorite Swiss village--Gimmelwald. 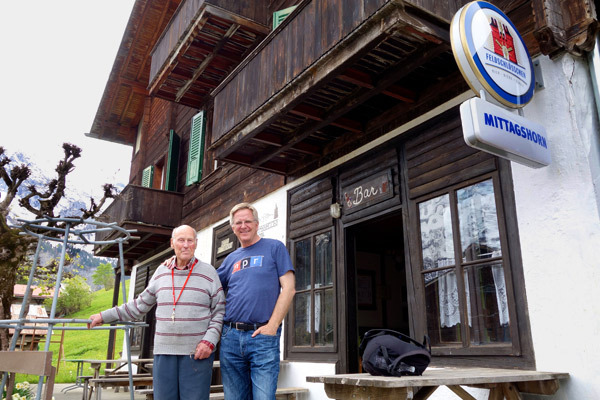 And, as he has for 30 years of visits, Walter Mittler was waiting at his Hotel Mittaghorn. Way back in my student days, I kept our groups in the rustic youth hostel here in Gimmelwald. Walter invited me to upgrade and keep my groups at his place, and I did. Walter symbolizes our leap from hostels to hotels, and the importance of personality-driven hotels and restaurants in our tour program. While we no longer sleep at Walter's hotel, I always drop in to say hi to my old friend. He's 90 years old now...and still going strong. A beer hits the spot after a good hike. 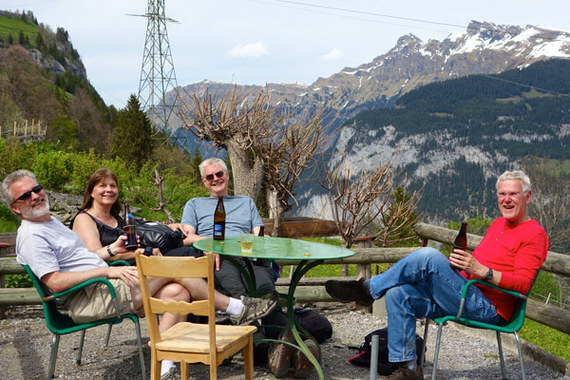 Here we sit, in front of Walter's Hotel Mittaghorn, in Gimmelwald...high in the Swiss Alps. Many travelers have fond memories of a nice frosty (or whatever) treat after an exhilarating natural or cultural experience in Europe. By the end of the day, Trish and I just couldn't stop hiking. So, rather than taking the standard gondola ride down to our hotel, we continued on foot...steeply and through the trees, hearing the rush of waterfalls one after the other all the way. Thankful for the great trail signage, I took a moment to share how the trails are organized for visitors. (Sorry--I misstated the hiking time in the clip. I won't even blame the altitude.) Between the 25- and 40-minute options, we took the 25-minute trail. Remembering to put weight on the balls of our feet rather than our heels when descending for sure-footedness, we got back to the hotel just in time for fondue.